All hail our new crab overlords. Cylostra Direfin is a banshee on a mission. On a boat journey to sing to the Phoenix King of the High Elves, a storm sank her boat and killed her crew, but this can't stop her. Her determination to perform keeps her furious spirit in the Old World, and she's going to sing to the Phoenix King one day no matter how many mortals puny she has to go through first. Cylostra is one of four heroes added in the Curse of the Vampire Coast expansion for Total War: Warhammer 2. Their strong personalities are reflected in their traits and abilities. Cylostra starts the campaign with the ghost of a Bretonnian hero at her side, and she can summon a ghostly unit of knights in battle as she resurrects members of the crew died with her. The Vampire Lord Luthor Harkon has had his mind splintered by a Lizardman hex, so a series of rotating traits affect his battlefield capabilities as he cycles through different aspects of his personality. The heroes have their personal objectives, but they are all united by the expansion's broader mission: to kill a legendary ocean creature and resurrect it to fight for them using a necromantic sea shanty. The Le Chuck-like Count Noctilus raids the Old World from a maelstrom in the deep seas, and the human pirate captain Aranessa Saltspire wants riches, and they're all about to fight one another for the prize. The result is a decent campaign-within-a-campaign with its own rules and special features. There are treasure maps, which you can find raiding ruins and taking out pirates. They give you a general map indicator and a small riddle. If you move a hero or general to the right spot and click the dig command they search for the loot, earning gold and acclaim when you hit the right spot. You can also hunt down pieces of eight to unlock regiments of renown. The pirate theme is strong. There's no ship combat in Total War: Warhammer 2 (which is probably for the best). Instead when ships clash you now have the option to fight a land battle on a nearby island or, if you're attacking a Dark Elf Black Ark, on the Ark itself. You fight with all of the combat units you've stuffed into the ship, and the expansion adds some new island maps. It's a fudge, but it's better than autoresolving all sea conflicts in a campaign that requires you to voyage out to the maelstrom and surrounding islands. 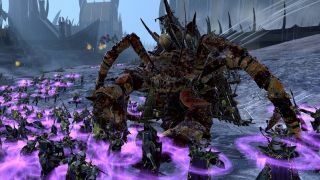 The Creative Assembly has reached into the fringes of Warhammer lore to create some excellent new units. Your basic deck zombies look good and sound the part (they say "yarr!" a lot), but they're a bit pathetic. You need to upgrade your hero's galleon and your settlements to access the best nonsense. That includes giant zombies with crab arms, giant crabs, and shipwrecks animated in giant humanoid forms. In the foreground, a renimated shipwreck, in the background a massive cannon called 'Big Bess'. I don't remember boats with guns in the tabletop game. A lot of these feel like they've been pulled from off-the-cuff references in an old rulebook or Dreadfleet tale. None of it feels out of place, however, which shows the close understanding CA has developed for the old Warhammer world. These factions feel right for DLC as well; you wouldn't reasonably expect vampire pirates to be a core faction in the main three games. I'm enjoying Curse of the Vampire Coast for similar reasons as the Tomb Kings expansion. It sets up a dark little world of warring bandits along the coast of Lustria. You know that somewhere across the ocean Nagash is doing some nonsense with the black pyramid, and to the north the High Elves are still trying to look after the vortex as the Dark Elves, Skaven and Lizardmen undermine them. I slightly prefer the item-hunting and crafting systems that came with the Tomb Kings because it let me play it like a Heroes of Might and Magic game. The Tomb Kings' ability to raise entire armies so quickly minimised economy and public order wrangling. It feels increasingly redundant to buy and slowly build structures to generate a bit of resource here, and a bit of public happiness there, especially when there's more going on on Total War: Warhammer 2's strategy map. Fortunately the Vampire Coast heroes can infiltrate ports to install a 'pirate cove' that siphons funds away from the unsuspecting population. That's a cool way to let someone else deal with that admin for you, and thematically it's perfect. A vampire pirate doesn't necessarily want a dozen castles, much better to leech plunder from humans little by little. By the time you've learned the magic sea shanty and raised the ocean monster, it will be too late for all of them. I have a feeling it will be Cylostra's finest performance.